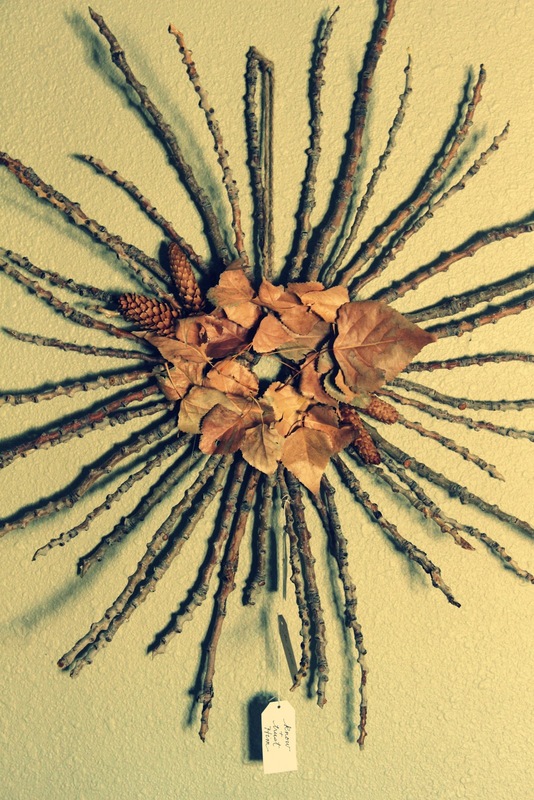 Awhile ago I came across a pretty and simple stick wreath by way of Pinterest. About a week or so ago, we had a strong wind storm blow through in the night. So strong that a stick from our cottonwoods about 150 feet from the house hit our bedroom window hard. As one can image, the next morning sticks lay all over the lawn. This week while the kids played in the mild, fall weather, all those sticks caught my attention again. The compost pile and the stick wreath came to mind. I chose the wreath. H and I collected a pile of at least 30-40 cottonwood sticks. Straight, little limbs off the cottonwoods are hard to come by, but we looked for the ones least curvy. I followed the directions from the original wreath: cutting a donut-shaped form from cardboard, wrapping the form in twine, hot gluing the sticks around the form as you like until the form is well covered, add twine for hanging on a wall or door. Pruning clippers came in real handy, too, for shortening and angled cuts. Already in pj's, the kids thought the wreath could use a little something more; so all 3 stepped outdoors with flashlights in search of handfuls of fallen leaves. With several pine cones for accents, too, the kids were satisfied. The next day I hung a few tagged sentiments from a bottom stick, and I was satisfied. I really like the plain, stick wreath idea, but ours certainly detoured from the original inspiration with our curved, bark-coated cottonwood twigs along with the other adornments. Every wreath will be unique based on each person (and group of munchkins involved) and each person's land and surroundings. That's the fun in it, I think. Hope you are having a sweet autumn! It's very pretty, Amy. And I love that the kids imagined it with additions and went to find what they needed....it's perfect!